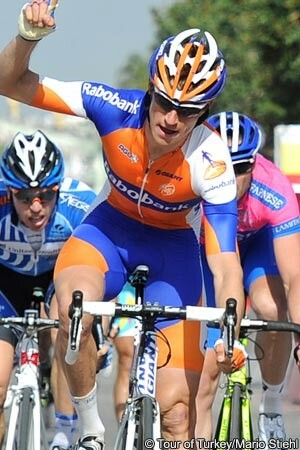 Theo Bos (Rabobank) took his first ever victory in the International Cycling Union (UCI) WorldTour as he outsprinted the peloton at the end of the third stage of the 2012 Eneco Tour, between Riemst and Genk, Belgium. The Dutch former track star was the first to open up his sprint at the end of the 188km stage and, despite sitting up to celebrate a little early, managed to hold off a late charge from John Degenkolb (Argos-Shimano) as he hit the line. Heinrich Haussler (Garmin-Sharp) improved on his fourth place on stage one with third place, not far behind Degenkolb. "It was a tough race," said Bos at the finish. "Even during the last kilometres I was wondering where I would find the strength. Yesterday we could already see that the whole team was strong and one rides such a final in a group, like a kind of team time trial. It’s nice that I am able to finish it off." With much of the race taking place over the border in the Netherlands, Bos' maiden WorldTour victory almost felt like a 'home race'. "Of course the finish was in Belgium, but still it’s nice," he said. "It happens to be the first time I win here, so actually we have a double first here today." The break of the day came from Alex Dowsett (Team Sky), Matteo Bono (Lampre-ISD), Laurens De Vreese (Topsport Vlaanderen-Mercator) and James Vanlandschoot (Accent.jobs-Willems Verandas). The quartet escaped in the opening kilometres of the stage, and was able to build a maximum lead of 5’25” in the first half before being gradually pulled back. Despite resisting the peloton’s advances in the final 22.7km finishing circuit, and a late jump from Vanlandschoot, the four riders were pulled back with ten kilometres to go. With the peloton all together once more the sprinters’ teams battled for control at the head of affairs. There was a late attack from David Tanner (Saxo Bank-Tinkoff Bank) in the final two kilometres, but he was pulled back by Bos’ Rabobank teammate Mark Renshaw. Argos-Shimano led into the finishing straight, but Bos jumped around the Dutch team and sprinted to victory. With the vast majority of the peloton finishing together, there were no changes at the top of the overall classification, with Jens Keukeleire (Orica-GreenEdge) holding onto his race lead. Although the stage started and finished in Belgium, after an opening loop the course headed east, over the border to the Limburg province of the Netherlands. Here it would take in a small circuit around Valkenberg, including two climbs of the Bemelerberg, and one of the Cauberg, where the World championship races were to finish just over a month later. Dowsett won the first intermediate sprint after 37.3km as the race crossed the finish line before heading into the Netherlands. The British rider was 36 seconds down on race leader Keukileire after the team time trial, but reduced it by three as he crossed the line in the lead. The group’s advantage reached 5’25” as Dowsett led the quartet over the top of the Cauberg after 77km, taking another three second bonus. Orica-GreenEdge steadily began to pull it back at this point though, with some help from Argos-Shimano. A counterattacking group pulled a few seconds clear after the intermediate sprint on the Muizenberg with 66km to go caused the peloton to accelerate a little and, with 60km to go, the gap below three minutes. It was down to less than 2’30” as the group was caught again, before being allowed to drift out to 3’20” again. With 30km though, it was down to 2’02” and, across the line to start the 22.7km finishing circuit, it was just 55 seconds. Under the 20km to go banner it was still 30 seconds but the quartet was holding out; many other teams began to mass forward, but the work was still being left the Orica-GreenEdge and Argos-Shimano. With 13km to go the gap was just a dozen seconds however, and the peloton had the four riders in sight on a long straight drag. As Rabobank pulled forward with 10km to go, all but Vanlandschoot sat up, but he too was forced to concede a few moments later. As the Belgian was captured the Lotto-Belisol team surged forward, along with FDJ-BigMat, and kept the pace high. Several other teams wanted to take control, with Lampre-ISD, Garmin-Sharp, Katusha and Argos-Shimano all putting men at the front. On the narrow roads, with a myriad of roundabouts and other road furniture though, it was impossible for one team to take control. Into the last five kilometres Rabobank took over once more, with Katusha and Movistar also coming up to keep the speed high but, with two kilometres to go, Tanner attacked. Despite pulling out a big gap the Australian was reeled in with just over 700 metres to go by compatriot Renshaw. Tom Veeleres was leading out Argos-Shimano teammate Degenkolb but, despite having lost his lead out man to the chase down of Tanner, Bos came around the two riders. The Dutchman got a good lead over the rest, but sat up a little early to celebrate and was almost caught on the line by Degenkolb.